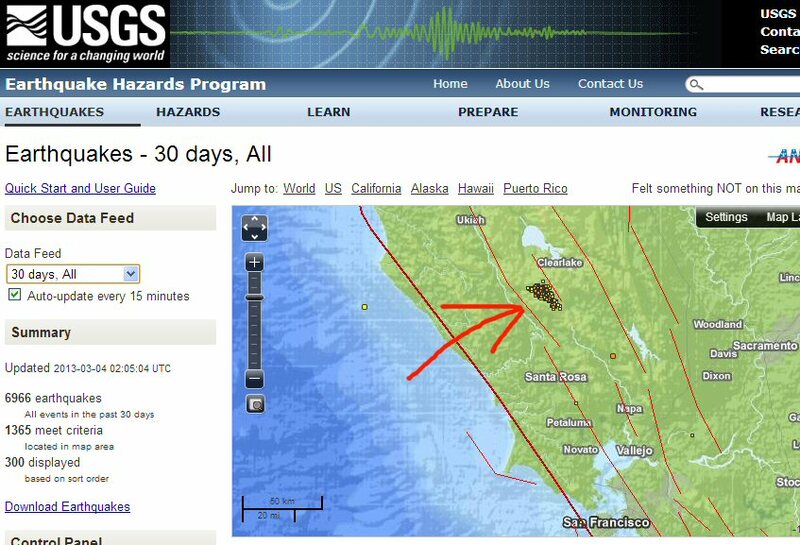 Lee.org » Blog Archive » Thousands of Earthquakes! Megan and I are going up to Calistoga for a weekend getaway. It got me thinking again about the ridiculous earthquake field I’ve seen on the USGS Earthquake Map. The earth is perpetually rumbling in this place! 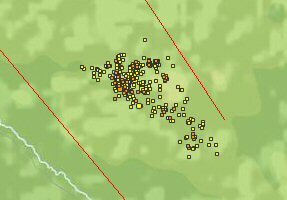 There were some 1,300 tiny earthquakes in this area in the last 30 days, 9 that were greater than 2.5. If you’re laying quietly, you’d have no trouble feeling those bigger ones. Apparently there is a giant bulb of magma about 4 miles underground and maybe 8 miles across. It’s a huge geothermal field. People keep pouring water on it to turn it into steam and run electric plants. The area called The Geysers in The Clear Lake Volcanic Field is the largest geothermal power producer in America. It provides more than 60% of the electricity between the Golden Gate Bridge and the Oregon state line! Calpine is a company that runs many of the geothermal plants and has a website about the Geysers. Steam levels started decreasing in the late 1980s because they weren’t putting water back into the ground. So now they pump 20 million gallons of treated waste water per day back into the ground from all the surrounding towns… notably Santa Rosa, more than 40 miles to the south. Yes, they pour huge quantities of grey water into the ground, to have it come out as superheated steam! A good portion of the earthquake activity is because pouring water on magma. If you’re really fascinated by this stuff, check out this Northern California Geological Society tour of the Clear Lake Volcanic area and the videos on Calpine’s Geysers website.